KINGSTON, Ont. 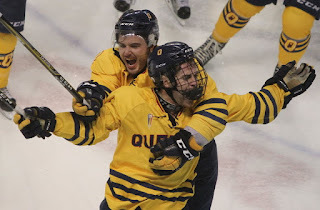 – Darcy Greenaway scored at 1:21 of overtime to give the Queen’s Gaels a 6-5 victory over the Royal Military College Paladins in an exhilarating 32nd Carr-Harris Cup Challenge. It was the 20th win by Queen’s in the history of the series, which celebrates a hockey rivalry between the schools that goes back to 1886. The 32nd meeting in the Carr-Harris game will go down as one of the most thrilling in the series’ history. It was also played before a series record crowd of 3,524 at the Rogers K-Rock Centre on Thursday night. While the Gaels were the ones who skated away with the two points, both teams were winners in terms of promoting Ontario University Athletics hockey at its finest. “If people who were at this game don’t come back next year, I’ll be shocked. The entertainment value was huge,” Queen’s coach Brett Gibson said. “They saw great goals, saw big hits, saw two teams competing real hard and the atmosphere was fantastic. Four times the Gaels went in front and four times the Paladins came back to square it up. The final time was when Dylan Giberson scored at 12:47 of the third period to pull the Paladins into a 5-5 tie. The Paladins played the rest of the period with an eye toward getting to overtime to at least get one point out of it. The Paladins, with three games left on the OUA schedule, are now tied with the University of Quebec at Trois-Rivieres Patriots for the eighth and final playoff berth. Slater Doggett, selected Queen’s most valuable player, scored twice for the Gaels (17-5-3), who are nationally ranked. Alex Stothart, Ryan Bloom and Luke Edwards also scored for the Gaels, who had period leads of 3-1 and 4-3. Rookie Riley Brandt from Trail, B.C., scored twice and added an assist for the Paladins. Brandt regained the lead in U Sports for goals with his 18th and 19th of the season. Scott Emerson and David Savery also scored. Gibson, who is now 9-3 in Carr-Harris Cup games, said his post-game message to his players was on how they found a way to win. Lim said there was the point and positives for his team to take away. The victory is the ninth in 11 games for the Gaels, who are building up for another playoff run. Queen’s played in the national championship last year. “Every point is important and we’re climbing. That’s the good news,” Gibson said. A 4-3 win by the McGill Redmen over the University of Quebec at Trois-Rivieres Patriots ended the Gaels’ hopes for a first-place finish in the OUA East. … The most recent two-time winner of the Mary Carr-Harris most valuable player of the game is Queen’s Kelly Jackson (2011-12). An MVP is picked from each team. Last year’s winners were Graeme Brown of the Gaels and Seamus Maguire of the Paladins. … The teams continue their OUA schedule on Saturday: Queen’s plays Carleton in Ottawa and RMC hosts Concordia at Constantine Arena at 7 p.m. … Francesco Vilardi of the Gaels is the older brother of Kingston Frontenacs’ Gabe Vilardi. Francesco Vilardi, 22, played 203 games in the Ontario Hockey League for the Flint Firebirds.